The 16th-ranked UC San Diego men’s basketball team came up just short in both away games this past weekend. 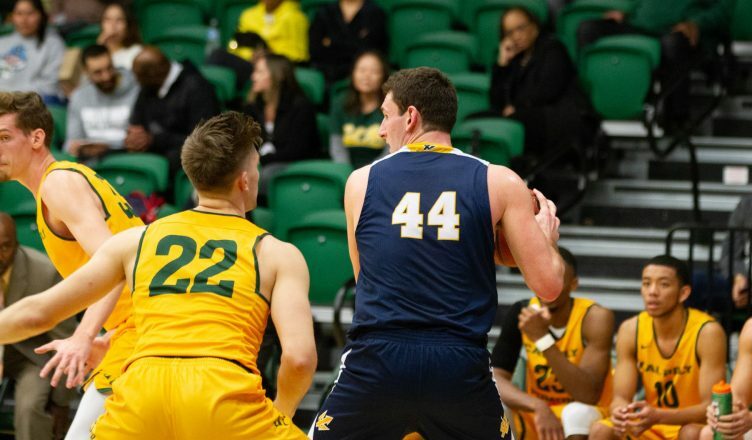 With scores of 67–62 and 77–75, the Tritons lost to the California State Polytechnic University Pomona Broncos and the California State University San Bernardino Coyotes, respectively. As a result, UCSD fell to 17–6 overall and 12–4 in the California Collegiate Athletic Association placing it in second place behind the California State University East Bay Pioneers(18–5; 13–4). As the regular season trickles down to the wire, the Tritons matched up against the Broncos for the first time this year on Thursday, Feb. 7 on the road. Through the first 10 minutes of the game, the score remained close at 23–16 with the Tritons trailing by just 7. However, the Broncos began to pull away shortly after, increasing their lead to 19 with 1:02 remaining and securing that lead heading into the locker room at the end of the first half. The Tritons shot 32 percent (8–25) from field goal range compared to the Broncos 56.7 percent (17–30) after the first 20 minutes of play. Cal Poly Pomona’s bench contributed 24 points and 18 points in the paint contributing to the huge lead early on. Junior forward Scott Everman nailed 4 big shots from beyond the 3-point arc in the first half. Aside from his 12 points, Everman collected 3 assists and 2 rebounds in his 32 minutes of play. The blue and gold came out of the half playing well. Senior guard Christian Bayne dropped a 3-pointer to bring the lead within striking distance. However, the Broncos went up by 22 points after just four minutes in the second half. Led by redshirt freshman guard Tyrell Roberts and redshirt junior center Chris Hansen, the Tritons answered back and cut the score to 3 at the 7:13 marker thanks to a 27–4 run, a difficult feat to accomplish on the road. Hansen tallied 7 points within the time span of the comeback as Roberts recorded 9. Hansen concluded the game with 13 points and snagged 9 rebounds, 8 on the defensive end, as well as 2 assists and 2 blocks. Roberts finished with a team-high of 14 points, in addition to 3 assists and 7 rebounds. Both Bayne and sophomore guard Gabe Hadley scored 8 apiece while Bayne facilitated 3 assists and Hadley just 2. A late come-from-behind surge of effort would not be enough to seal the victory though. An improved 56.7 percent (17–30) from the field, 66.7 percent (6–9) from 3-point range and a 100 percent (6–6) from the line brought the Tritons within inches of pulling but a tough road win, but the Bronco defense held its own and secured the win. After a tough deficit just two days before, the Tritons were hungry for a win as they headed into their matchup against the Coyotes on Saturday, Feb. 9. Hansen started the game off right, capitalizing on 3 free throws in a row after being fouled from outside the arc. Although, in heartbreaking fashion, UCSD fell once again as the game came down to the last couple seconds. The Tritons were in control for much of the game until the second half — a back and forth performance as the teams traded 12 point leads with each other. With four seconds to go and the score tied at 75, a final Coyotes layup would determine the unfortunate outcome. Bayne finished with a game-high 29 points, shooting 8–17 from the field and 5–10 in 3-pointers, as well as a perfect 8–8 in free throws. On top of his scoring, Bayne had 2 assists and 2 rebounds to add to his stellar night. Everman tallied 13 points and snatched 3 rebounds while Hansen totaled 16 points and 13 rebounds for his ninth double-double this year. After a promising 39–30 lead in the first half for UCSD, San Bernardino State outscored the Tritons 47–36 in the second half. A poor shooting performance from the Tritons (30.8 percent) in relation to the Coyotes 54.8 percent and a 25–42 rebound disadvantage would make sense of the troubling defeat. The game accounted for a regular season split for the series after the Tritons beat the Coyotes back in November. UCSD will look to bounce back next week at home as they host California State University Dominguez Hills and California State University Los Angeles, the latter being a team that beat the Tritons early on in the season. The games are set for Thursday, Feb. 14 and Saturday, Feb. 16 with tipoff scheduled for 7:30 p.m. in their very own RIMAC Arena.